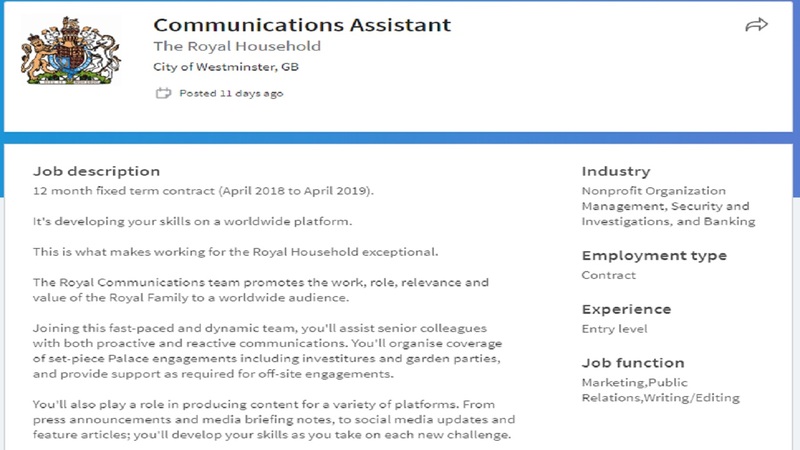 The royal family has posted a new job opening on Linkedin for a new communications assistant. It's not clear who the employee will work with, but the position comes with a 12 month contract, starting in April. According to the listing, the communications assistant will organize coverage of palace engagements and will play a role in producing content for a variety of platforms. Here's a direct quote from the post, "Although based primarily at Buckingham Palace, you'll also travel in the UK or overseas to support important visits and engagements." The position comes with 33 days of vacation time and pays 22 thousand pounds. That's about $33,000 dollars.